In September Raptr and AMD released their dedicated build for PC Gamers, the app included automatic configurations aimed at AMD hardware per game and while limited it provided optimal settings per system. Flash forward almost 2 months and the gaming selection has increased greatly from that initial point. 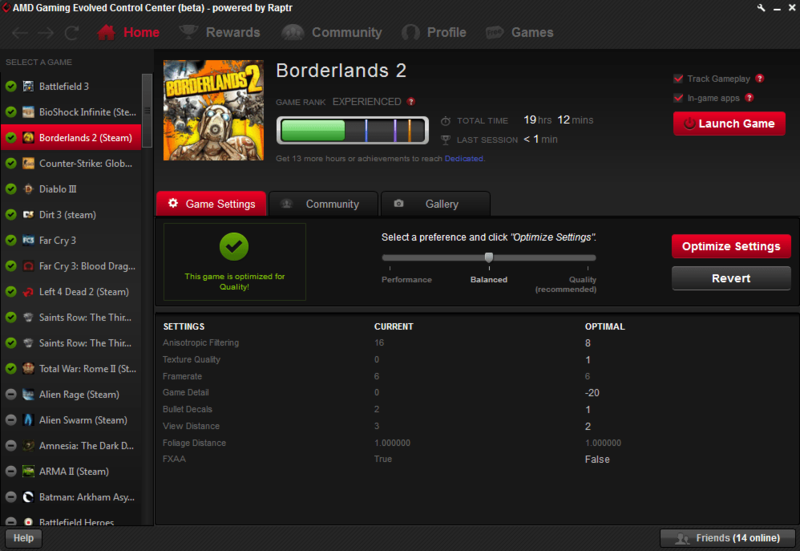 The first thing to notice about the AMD Gaming Evolved Control Center is it uses a completely different interface from the standard Raptr affair. Delivering a game center, community, gallery and settings per title with dedicated fast access areas for rewards, global community, profiles and free games. It’s a simple presentation but that’s what makes it impressive, users can use a slider to gauge settings or select optimal choices for their hardware to avoid overtaxing the card and it helps bridge that gap of configuration for those new to the platform. For classic Raptr users it may take a bit of time to avoid using the classic dock to navigate but the new UI and presentation do become familiar over time. For me, rewards, friends, game settings are the primary areas I use and they’re almost easy to reach, the friend option itself blends almost too well in the bottom, easily overlooked with bright red text or buttons elsewhere in the UI. While the AMD branded app doesn’t support everything, they’re working hard to implement feedback and suggest the best possible settings for each product they do include. A relief given past optimizations tended to massively reach over the recommended settings or dull textures so much it was painful to play just for performance sake. Do the settings make a difference if you’re adept with hardware? Somewhat, there are certain assumptions made with game settings that might not apply to a specific title and only incur minimal frame loss, by default I tend to disable any AA period for the extra gains at higher resolutions, often with the AMD Raptr application it turns it back on and I’m unable to feel the impact at 1-2fps lost. It’s a reminder in gaming that it always pays to experiment and in this case, it does it for you with a slider and a click of a button. Personally, I now use Raptr much more than I used to, I explore the community pages, rewards, profiles and have a longer immersion in the community and offerings than I ever did in the past. As a revised presentation I enjoy it and think newbie PC gamers and even veterans might enjoy the quick flip of a switch to adjust performance as needed and get into the game. It’s one thing to play casually but often it’s the performance setting that helps gain any extra FPS possible in competition. I look forward to continued adjustments to the app (more game custom configurations please) there’s certainly room to continue tweaking for the masses, one can only imagine the day when players will be able to save custom configurations they’ve made to activate on the fly. Check it out for yourself, if you already have Raptr there’s no additional login needed, just write over your existing install and voila. Also if you’re running AMD video hardware you can enter the ongoing Gaming Evolved Sweepstakes for games each day, although you do have to game for an hour on a supported title.